UBCF will give away 264 Tempur-Pedic® mattresses to male and female breast cancer patients, survivors and their children 18 or younger. The United Breast Cancer Foundation (UBCF) is pleased to partner with Good360 to provide Tempur-Pedic® mattresses at no cost to male and female breast cancer patients, survivors and their children 18 years or younger. The trusted Tempur-Pedic® Mattress brand offers the comfort and support necessary to promote a good night’s sleep, something that is vitally important to the healing process and improving the quality of life for those touched by breast cancer. 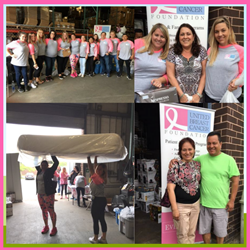 On Saturday July 21tst UBCF will give away 264 Tempur-Pedic® mattresses to the breast cancer community at the International Warehouse Group (IWG). IWG generously donated their warehouse space in Old Bethpage, Long Island to facilitate this event. For more information please call UBCF at 1-877-822-4287 x 726 or email GIKProgram(at)ubcf.org. In addition to the new Tempur-Pedic® mattresses, United Breast Cancer Foundation will give away other household items, clothing, shoes and personal care products from trusted brands like J.Jill, Talbots, Eddie Bauer, First Aid Beauty, Noodle and Boo, Estee Lauder, Eos, Burt's Bees, Nike, Culligan and George Foreman. Cancer care and recovery is expensive. Very often large purchases such as mattresses and other daily necessities are delayed or abandoned all together due to mounting medical bills. UBCF and its partners are here to help. This is the Foundation’s third large mattress event in the past 12 months. UBCF expects over 150 people to attend the event and estimates providing items valued over $1,570,000 to deserving women, men and children. UBCF will host additional Tempur-Pedic® Mattress Events this year in Maryland, Virginia, Florida and California, exact dates TBD. To learn more and apply, contact UBCF at 1-877-822-4287 x 726 or email GIKProgram@ubcf.org.